Dr Judy Sorum Brown shares links to pages, websites and blogs that further the discussion of leadership, dialogue and change. Author and poet Judy Brown finds these resources of inspiration, learning and wonder and is pleased to share them with her audience. A curated collection of tools for developing leadership skills. Below are resources, websites, connections that I hope might be helpful to you. I hope that you will find them interesting or useful in some way. Enjoy. On Being with Krista Tippett is a podcast of rich conversation full of spirit and vision. I invariably get swept away in the conversation. Below is just one of the many wonderful offerings from On Being. Pianoscapes: Off and on since 1993, Judy Brown and Michael Jones, both leadership educators, dialogue experts and artists, have worked together, through The Fetzer Institute, The International Leadership Association, and The Center for Professional Excellence at the University of Texas at San Antonio. Judy and Michael share an interest in the power of place, Judy having grown up on the 45th parallel in Northwestern Michigan and Michael making his home at almost the same parallel in Ontario, Canada. Michael Jones creates many memorable moments through his art, his stories and his facilitation. A widely acclaimed Juno nominated (Canadian Grammy) pianist and composer whose 1983 album PIANOSCAPES would serve as a benchmark for contemporary instrumental music - Michael is also a widely recognized leadership speaker and educator, writer, thought leader and creative facilitator. In 2002 Weatherhead School of Management launched an initiative called the "world inquiry into business as an agent of world benefit" where faculty and students across the school established a data bank to discover and showcase profitable business innovation in the arena of environmental sustainability and social entrepreneurship. After 2,000 interviews, we soon realized that the data bank was documenting a revolution. Judy and eight colleagues completed a Fowler Center sponsored project focusing on the link between spirituality and sustainability--a quite unusual focus to find in a first-rate business school. 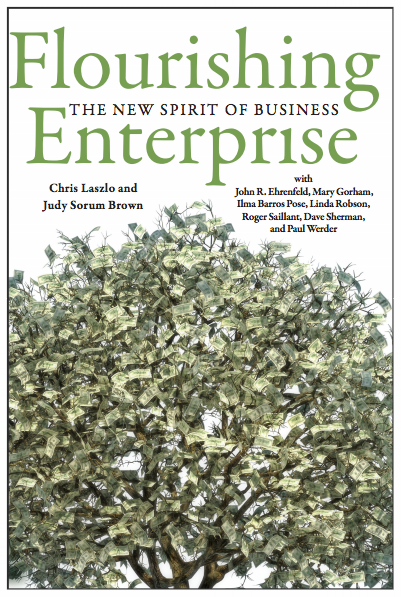 Together (yes, together) they have written a book entitled Flourishing Enterprise; The New Spirit of Business. The book was a center piece at The Global Forum held in Cleveland, OH at the Weatherhead School of Management on the campus of Case Western Reserve University. Judy led a session on Mindfulness Through Poetry and Other Aesthetics. LeadingAge is an association of 6,000 not-for-profit organizations dedicated to making America a better place to grow old. We advance policies, promote practices and conduct research that supports, enables and empowers people to live fully as they age. Our promise: Inspire. Serve. Advocate. With a team of colleagues from Leading Age, Judy guides a year-long nation-wide leadership development program for emerging leaders in the field of services for elders (think life care communities, home care, affordable housing, nursing homes, hospice). This highly competitive program selects 48 leaders a year to participate in 5 retreats, a series of site-visits, an action learning process and a demanding study-circle process. Now in its tenth year, the program has a very active alumni network of over 200 leaders nation-wide. In 2015, Judy and her colleagues at Leading Age, launched The Leadership Educators Program to support those in the field, who are designing and facilitating leadership development programs for states and for single organizations. When you're committed to making the world a better place, it's vital to align your daily life and work with your core values. We help you listen, live and lead with integrity so you can serve the world with courage. Judy joined this community practice as it was just coming into being in the 1990's, and was one of those in the first circle of facilitators who apprenticed with Parker Palmer. Her work has long reflected the values and many of the practices that have become known as "the courage" work. In addition to the presence of the courage and renewal practices in her work on leadership, Judy is active in a group of facilitators focusing on transitions and particularly the transitions people experience in third 30 years of life. 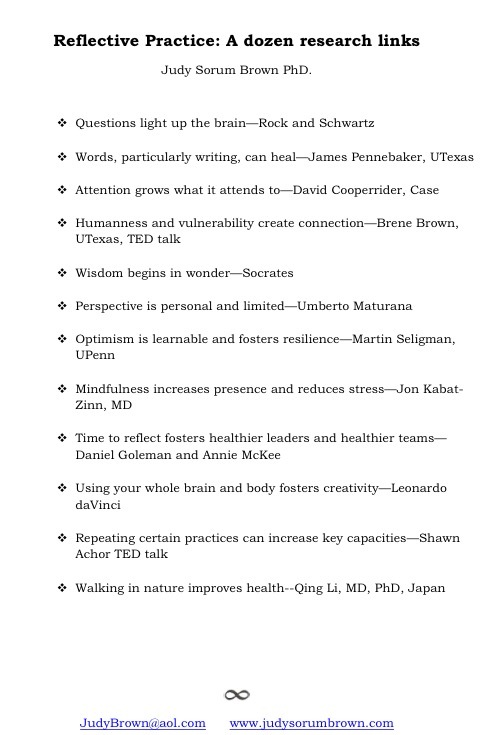 Brain Pickings by Maria Popova--a splendid selection of creative, spiritual, and interesting books that have moved and influenced Maria are discussed, and reviewed. Be prepared to find your reading list and mind expanded.